Visited the Society of Botanical Artists’ (www.soc-botanical-artists.org) annual exhibition in Westminster today, what a treat. Over 700 works on display meaning that on entering the hall you left behind a dismal damp morning in central London and exchanged it for a celebration of the plant world exquisitely rendered in a variety of media. One picture of a primrose (Primula vulgaris) in watercolour on vellum was so lifelike you could sense the texture of the leaves in your fingertips. Returning home the weather tempted me into the garden so I weeded, planted some Digitalis ‘Sutton’s Apricot’ seeds for next year and some Borage (Borago officianalis) for adding to my Pimms this summer. 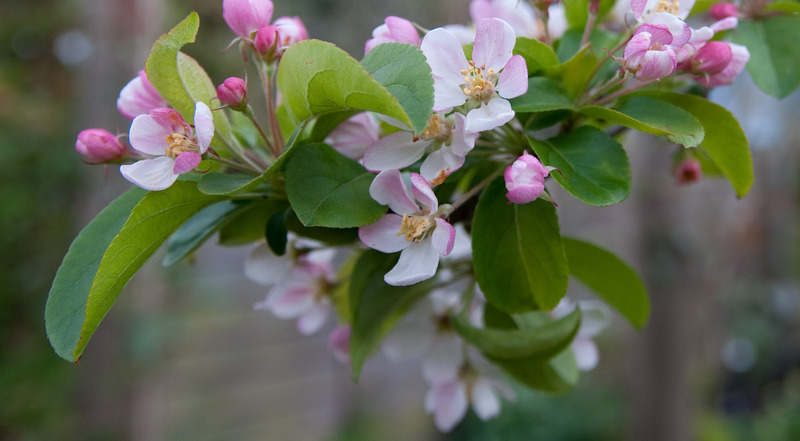 This time 12 months ago it was Easter Sunday which meant no work on the re-design for a few days, so I return you to the crab apple whose blossom is finally opening. The cool weather we’ve had this April has meant that blossom and bulbs are lasting for weeks rather than days which is great, it’s always swings and roundabouts in the garden! This entry was posted in In my garden, Out of my garden and tagged blossom, Botanical Art, coming home, gardening, specimen plants, spring day. Bookmark the permalink. Ah, yes, it is paler – it’s beautiful!